It’s times like these that I wish I had two eyes instead of one! 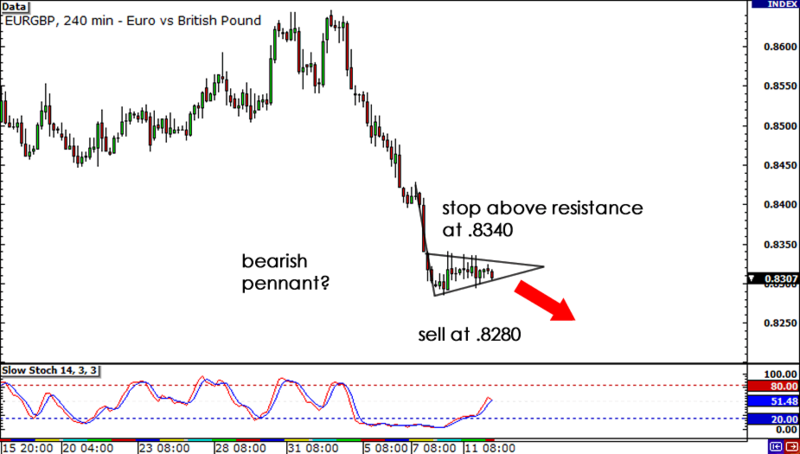 While my single eye was focused on that bearish flag I had spotted on EUR/GBP, I was unaware of the ascending triangle that was forming on the pair. Had I noticed it earlier, I could’ve switched my bias and played the break upwards instead of downwards! Drat! Apparently, the beautiful 100-pip rally was caused by a couple of things. First, Spain and Italy were able to pull of their bond auctions without a hitch. Second, ECB President Jean-Claude Trichet surprised everyone at the press conference when he sounded unexpectedly hawkish. These two combined to send the euro flying across the charts, leaving me in the dust with an empty pip-bag. Oh well, at least I didn’t start the year off with a loss. My no-loss streak is still intact, and I’m looking to extend it. Boo yeah! Catch ya’ll later! I’m back and ready to attack, baby! Let’s get this show on the road! After sliding down across the charts last week, EUR/GBP seems to have come to a pause as it has consolidated over the past couple of days. Does this mean that euro bulls are coming back to play? If you ask me, I don’t think so. The pair has formed a bearish pennant, and I think sellers are just waiting for more reason to short this sucker. I’m looking to do the same, as I’m waiting for the pair to break lower on any euro selling. I plan to short the pair below the recent lows at .8280, while putting my stop at .8340, just above this week’s highs. I think if the pennant does break, it could be a sign that the pair is headed much lower. I’ll be looking to take profit at around .8150, which was a major support level late last year. Fundamentally, given the euro zone’s underlying problems, the trade seems sound. The euro has been taking a beating with the international spotlight focusing on Portugal and its debt problems. As a matter of fact, they say Portugal is likely to be the region’s third bailout recipient. But this trade is not without risk. Sometime today, Portugal will be holding its bond auction, and tomorrow, Spain and Italy will be issuing their own debt instruments. These bonds are expected to gather quite a bit of interest and demand from investors, which could spur the euro to stage a rally. At the same time, I can’t deny that potentially large gains can be made from this trade. If the auctions flop and the euro breaks down, I could find myself on the receiving end of major pips! As for the pound side of the equation, we’ve got a potential pound-supporting report due today in the trade balance support. A recent pickup in manufacturing activity is expected to translate into a slimmer deficit for the U.K.
Short EUR/GBP at .8280, stop loss at .8340, profit target at .8150. This gives me a PT:SL ratio of 130:60, giving me a roughly 2:1 reward-to-risk ratio. As usual, I’ll be risking 1% on this trade. I’m still carrying a two-trade win streak from last year, hopefully I can start 2011 on the right note!